Nature abhors a vacuum they say and there is no bigger vacuum at the minute than the political situation in Northern Ireland. Almost six months on from the previous outing for Accidental Theatre’s Michelle and Arlene and there is no let up in the stalemate with Stormont still in shadow. Stepping in to the space is Rosemary Jenkinson’s latest installment of the brash, up-to-the-minute farce that is ‘Michelle and Arlene: Love in Las Vegas’ where the hypocrisy of our politicians is skewered with broad humour and a few musical numbers! Following on from last year’s Christmas Special, where the two women ended up stranded in Bulgaria and hi-jinx ensued, this time round they are headed for the States – to Good Friday anniversary talks with none other than Bill Clinton. In the wake of the RHI scandal, Arlene is feeling the pressure and sensing the end of her political career, she abandons the talks to pursue her dream of being a singer in Las Vegas. As she says to her beloved husband Brian, ‘I’ve come to a place in the desert….just like Jesus did’. Both actors are now well-settled into their roles, with Mary-Frances Doherty playing Michelle as the slightly ditzy party girl, only interested in celebrity and getting herself on the Ellen show. Maria Connolly’s Arlene is a work of art and it’s getting difficult now to look at the real Arlene and not see hints of Maria’s portrayal. She is in her element here, particularly when Arlene enters a Dolly Parton Tribute competition and her rendition of ‘Jolene’ sparks the biggest laughs of the evening. Michelle and Arlene: Love in Las Vegas is the most successful of Jenkinson’s trilogy so far. It benefits from a tighter plot, ridiculous as that plot may be and some very funny one liners, often pushing the satire to some darker places. The sharp script has a feel of being written right up to the minute of the performance, and includes references to Gerry Kelly’s bolt-cutter incident, Arlene’s charity single performance and even takes a clever swipe at Ulster Rugby. 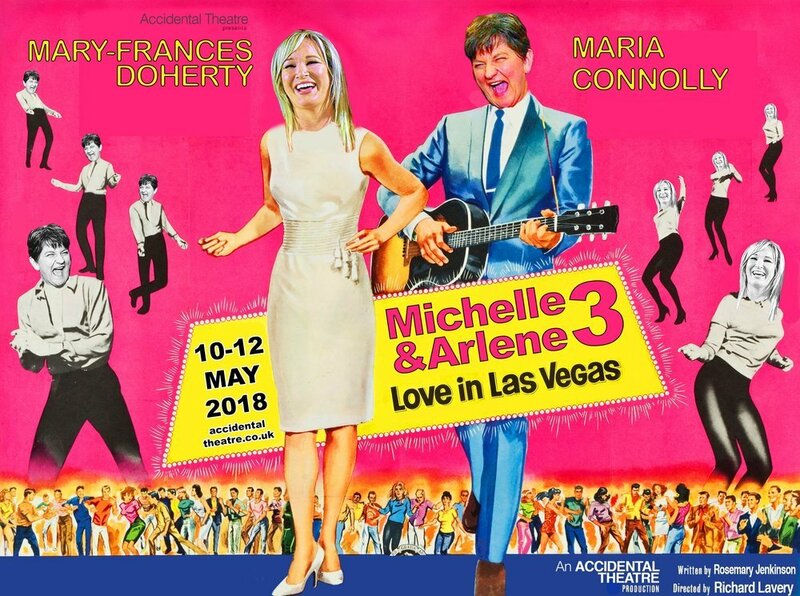 There is a suggestion that this may be the last Michelle and Arlene outing for a while and that might not be a bad thing. There is only so much that can be mined from the frustrating political inaction in Northern Ireland and this production allows our ladies – ‘one of the great double acts in history’ – to go out in style.